The marriage of two different concepts in the lifting field to open up new horizons and new application opportunities. That is the perspective that gave rise to the concept of the new JF545 by Jekko, which has been recently presented to the market with the clear objective of bringing together and transforming the field of mini cranes and articulated cranes. 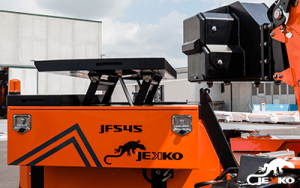 Because the new JF – developed by the Treviso Italy company that is a world leader in mini cranes in partnership with Fassi – changes the traditional lifting systems by putting onto tracks what has always been naturally mounted on trucks: the articulated crane. And as always, by changing perspective, one discovers a completely new world, and new scope, potential, infinite applications for an instrument that combines the strong points of different areas. “The mini crane culture” – Diego Tomasella the CEO of Jekko explains – “is taking an important step towards articulated cranes to present an innovative product that is simple to use, within reach of a wider market that is continuously searching for new solutions, in particular in the area of maintenance and service, in increasingly complex logistical and environmental contexts”. It’s clear that using an articulated crane is an essential feature of this vehicle that has a double articulation of the basic arm to which a jib can be added that makes the joints three, permitting a variety and vast scope compared with the traditional mini crane with the typical telescopic arm with a chain system. 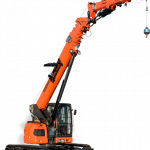 The JF545 is a crane that can work horizontally, vertically, overtake, go round, use a direct hook or a winch. 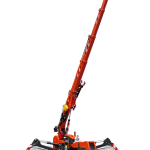 A 3-person hydraulic platform can also be used in conjunction with double articulation and a two-person basket can be used if the jib is used, for heights up to 31 metres. The basic concept is to bring down to ground level everything that is normally used on a truck. This means having accessibility potential and reduction of overall dimensions with an important favourable impact on the logistics. 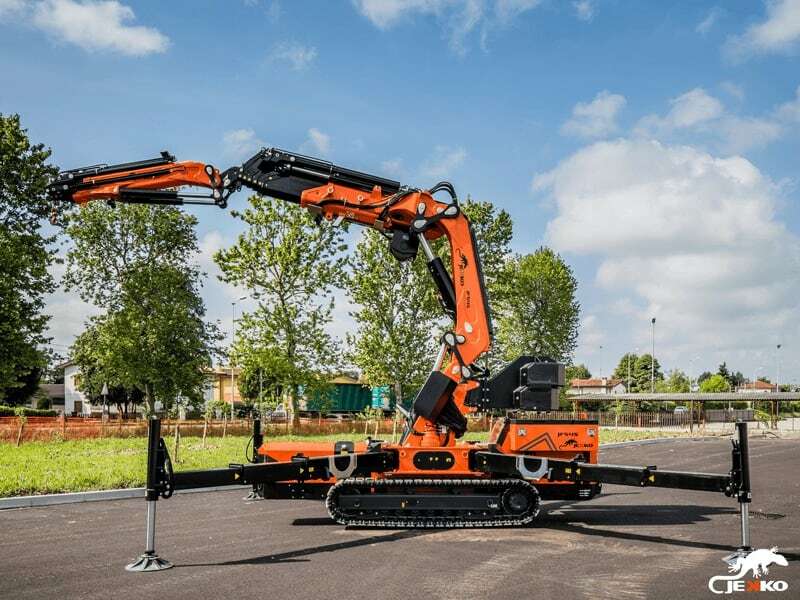 You can take the crane to and use it in all those areas that a truck cannot access: industrial areas, confined spaces, narrow medieval streets, fenced-off parks and in general anywhere that a tracked articulated crane can access easily thanks to its reduced overall dimensions. The JF also uses a lifting moment limiter instead of the electronic limiter normally used on a mini crane. 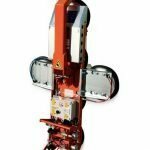 This greatly significantly simplifies use because the machine feedback is given on the pressure reference (max. 345 bar) and not on input/output software. Accordingly, when the machine is 100% stabilized it can use maximum pressure to work at 360 degrees. Alternatively, using the position of the stabilizers and of the resulting tip-over line, one of the four “stability levels” is calculated automatically, 1 being the minimum and 4 being the maximum level, with reference to four different classes of pressure. 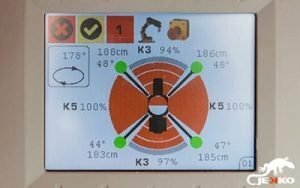 This means that the operator – with a very simple graphic output based on the four levels – can choose from infinite lifting possibilities according to the area of stabilization and, obviously, in compliance with the latest safety regulations. This machine is able to use ballast weighing 3500 kilos with an innovative automatic release system thanks to a tilting surface that intercepts the ballast hydraulically. Everything is radio-controlled. At this point, the operator just needs to remove the locking pins and release the ballast directly. This becomes extremely useful in situations of confined space and limited logistics when it is not necessary to use ballast. But that is not all, because once the ballast has been removed, the tilting surface can be used to load and transport up to 3500 kilos of suitably fixed and secured material. 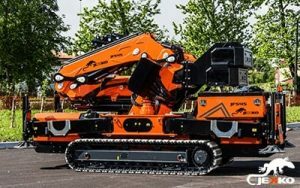 One of the cornerstones of the Jekko philosophy that is also applied to this crane is that it can be completely managed by a single operator who can perform all the operations in complete safety, also thanks to the radio control that is an extension of the machine that is always ready to hand. This gives the operator complete independence to switch on/switch off, handle the crane and ballast, stabilize, supplement the jib: doing everything needed to get the most out of the crane. The radio control is latest generation, with a user-friendly graphic interface that enables innumerable options to be managed easily and intuitively, also thanks to the automotive-type menu selection wheel. 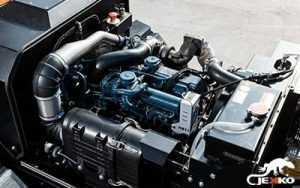 The JF545 has both a 55 Kw Kubota diesel engine and a 13 Kw three-phase electric motor. Depending on the situation and needs, the operator can easily switch from one solution to the other, with great flexibility, for both indoor and outdoor use. Such a versatile crane is used in the most widely varying circumstances: special lifting situations, placing items in confined spaces on construction sites (beams, suspended platforms, glass, air-conditioning systems, etc) or on industrial sites (machines of different sizes), maintenance and servicing. 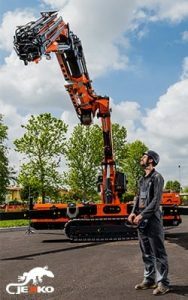 It can be the perfect machine for companies specializing in lifting that complements their existing range of truck-mounted articulated cranes and city cranes. 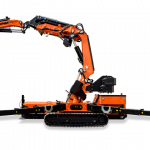 But it is also the perfect machine for rental companies specializing in supplying operated and non-operated equipment. 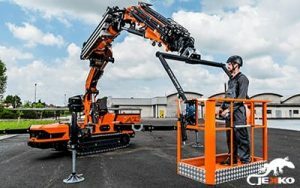 It can be ideal for those specializing in niche markets, with great and extremely specialized needs, but more generally for all those who want to exploit the typical advantages of an articulated crane in areas that are inaccessible for trucks. In general, the market requires cranes that are increasingly compact but have the same lifting capacity for obvious reasons of economy and cost, potential, logistics, maintenance and ease of use. The new JF545 has been created to cater for precisely these needs.